As you may have gathered by now (if you’ve read any of my reviews), the majority of purifiers employ HEPA filtering technology in order to rid air of contaminants. However, you will find that HEPA filtration is often combined with other technologies such as active carbon filters, ionizers, UV filters and many others. Each type of filter when considered separately is rarely all things to all people. So in order to fulfill all the user requirements and filter air in the best way possible, manufacturers combine several types of filtration. Each type has its advantages and disadvantages, so I’ve decided to shed some light on the matter. Electrostatic filters or electrostatic precipitators are based on a two-stage filtration principle, and they consist of two sections: the charging section and the collection section. The first stage begins when the electrostatic filter employs ionized wires in order to infuse the contaminant particles, such as dust, pollen, smoke and fumes with small positive charges. The charged particles are attracted to the negatively charged electrical field in the collection section which contains a row of metal plates. The particles are then collected on the plates, and thus trapped whilst clean air is released into the room. Electrostatic filters are very effective, and can collect particles as small as 0.01 microns in diameter which even beats HEPA filters! They have an open cell design which is there to maintain a low pressure drop which in turn, means less power is required. This means savings in terms of energy and quieter operation. Adding to the cost-cutting pattern is the fact that this type of filter can be cleaned, or even washed in a dishwasher. In the long run, it will save you money and the hassle of having to buy a new filter every year. Ionizers can often be found in air purifiers in combination with HEPA filters. They use a negative ion generator which introduces negatively charged ions that in turn, attract positively charged air pollutants. As the particles group together they become too heavy and fall from the air. Although do bear in mind you will be able to see the evidence! One great thing about ionizers is that they are extremely effective at removing smoke particles from air. On the other hand, if your problem is dust, pollen, dust mites or some other common allergen an ionizer won’t do you much good because the particles will not be removed completely. The biggest concern regarding ionizers is the fact they create ozone which can be harmful in large concentrations. However, many manufacturers have addressed this issue. Just make sure you check the safety certifications included. 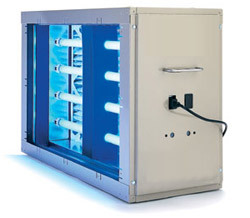 In the case of UV filtration, a UV light is employed to treat airborne contaminants. By using UV light of a certain wavelength, air purifiers are able to break down the DNA of living organisms such as bacteria, mold and yeast sport, fungus, mildew and even molecular bonds inside the RNA of a virus. This is why they’re often used in institutions such as hospitals, schools and laboratories. As ideal as UV filters sound, they have their flaws. They are not effective when it comes to removing non-living contaminants such as dust, allergens, fumes, odors, and gases which is why you will often find them paired up with some other type of filter. I would like to point out that if you opt for an air purifier that uses germicidal UV light, make sure that you choose one which doesn’t produce ozone. A Thermodynamic Sterilization System (TSS) uses heat to sterilize airborne pollutant particles inside your home. Kind of like an incinerator of sorts. While it may seem like a scary concept, the technology is actually pretty “cool”. An air purifier with TSS has a ceramic core that develops temperatures of up to 200C. This kills 99.99% of pathogens such as bacteria, viruses, dust mites, mold, and fungi spores. The air is then cooled and introduced back into the room. As is the case with UV light, actual filtration doesn’t occur. The particles are either incinerated or sterilized. One plus to remember with this technology is it doesn’t produce ozone. There you have it. I have covered nearly all types of filters worth mentioning. Hopefully, after reading this you should be more than ready to tell which air purifier is the right one for you. Good luck!